Narco-trafficking cartels are migrating to the Andes region in Bolivia, where a diminished U.S. presence has allowed a boom in cocaine production and the opening of new drug routes, regional anti-drug officials say. Recent studies by the U.N. Office on Drugs and Crime show a steep rise in cocaine production in Bolivia and a smaller increase in Peru. They also show a drop in Colombian cocaine output, which is subject to increased anti-drug efforts by the U.S. and Colombian governments. Potentially more significant is Bolivia’s emergence as a major hub for jungle laboratories that turn coca paste, which can be imported from anywhere in the Andean region, into refined cocaine. “Like never before we have discovered these types of factories around the country,” said Col. Oscar Nina, chief of Bolivia’s police anti-drug unit. He added that his unit has destroyed more than 20 cocaine laboratories so far this year. In addition, he recently warned of the increasing presence of powerful Mexican crime organizations that control drug movements. Other law enforcement officials say Colombians connected with the Revolutionary Armed Forces of Colombia, a leftist guerrilla group known by its Spanish acronym as FARC, are also shifting some operations to Bolivia because of recent military pressures on rebel-held areas. “They come directly in small airplanes and install themselves rapidly,” said a district attorney in Santa Cruz, the main province of eastern Bolivia, where much of the nation’s new drug production is thought to be concentrated. The official, who asked not to be named because of the threat of retaliation from drug traffickers, also said the Colombians are introducing the latest technologies for refining cocaine into the finished product. Colombia is likely to remain the world’s top cocaine producer for years to come. Despite a 33 percent drop in Colombian cocaine production since 2005, it still produces four times the 113,000 kilograms of Bolivia for 2008, according to the latest U.N. report. Peruvian anti-drug officials say much of Peru’s coca paste is now going to Bolivia, because refining facilities there are more numerous and secure and have easier access to chemicals needed to refine the white powder. 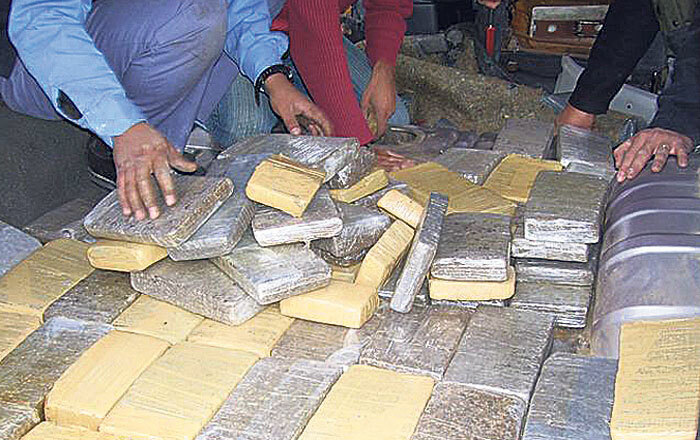 There exists a great refining capacity across the border in the Bolivian jungle,” said Gen. Miguel Hidalgo, the chief of Peru’s anti-drug agency. He said his conclusions are based on interrogations of drug pilots caught flying Peru’s raw product to Bolivia for processing. From there, officials say it is shipped to other nations, such as Argentina, Brazil and Paraguay. The U.N. report sites these and other nations of Latin America as the world’s fastest-growing market for cocaine as consumption levels off or declines in North America and Europe. Production in Bolivia is also said to benefit from last year’s expulsion of U.S. anti-drug agencies by leftist President Evo Morales. Bolivia’s deputy minister for social defense, Felix Caceres, called reports of increased drug trafficking in his nation exaggerated. He recently told reporters that Bolivia is strengthening its anti-drug efforts through bilateral agreements with Brazil and Argentina. Mr. Morales has turned to Russia and China for anti-drug assistance. Last month, Bolivia purchased six Chinese K-8 fighter jets to intercept drug flights. The Bolivian president was elected in late 2005 on pledges to legalize farming of coca leaves – the main ingredient for cocaine and a traditional cash crop for Indian peasants, who use the leaves as a mild stimulant. According to Brazilian intelligence reports quoted in the newspaper Folha de Sao Paulo, drug trafficking has increased sharply since the Drug Enforcement Administration left the country last year. Brazilian authorities said high-powered weapons, including 30 mm machine guns used by drug gangs against police helicopters, have been smuggled from Bolivia. Argentina has upgraded controls along its border, installing radars to track drug flights, which have been making cocaine drops. The newspaper La Nacion reported that Mexican drug bosses, operating with Russian crime organizations, have established major new routes from Argentina to Europe, Africa, Australia and New Zealand. A British warship recently intercepted a drug cargo off Argentine waters with an estimated street value of $500 million – one of the largest seizures on record. Bolivian opposition congressman Carlos Klinsky said most of the cocaine goes to Venezuela, which has been singled out by the United States as a “major drug-transit country.” According to Mr. Klinsky, bails of drugs are loaded onto hundreds of Venezuelan military flights as they land at various points in Bolivia. “There are no checks or controls on these flights” said Mr. Klinsky, who also blames the increased drug flow for a skyrocketing crime wave in Bolivian cities, where wars among competing drug gangs are becoming increasingly common.